Add your funny caption here in the comments. This entry was posted on Tuesday, July 3rd, 2007 at 10:00 am	and is filed under Cats, National Dog, Cat & Pet Info, Art & Pictures of Cats & Dogs. You can follow any responses to this entry through the RSS 2.0 feed. Both comments and pings are currently closed. 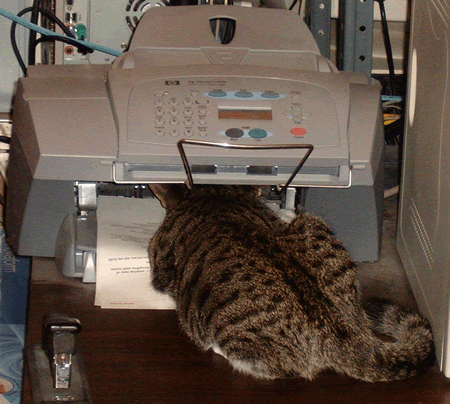 I see the problem and I will straighten out this paper jam. I am a wiz at this stuff. I have to check the fax and see if my letter to the President–telling him what I think of the commutation of Libby’s sentence–got there yet. Looks just like our old IT guy, head in the wrong machine. I know that mouse went in here somewhere! I can see the tail sticking out the back of this box. Oh ya, I can fix her, but it’s going to cost you a can of tuna for Overtime. ate da cord dat cunects da prinner an computer..